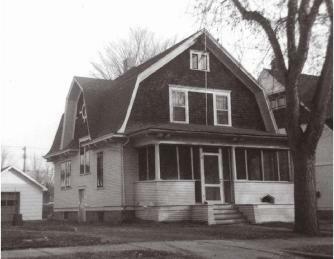 The property this Dutch Colonial style home is built on was part of the original plat of land designated "Lincoln” (present day Mandan), in 1875. On November 19, 1907, Cora Swanson, wife to railroad employee Herman Swanson, obtained the deed to this lot, and assumedly began construction of this house. Most homes of this style, popular since 1625, are found in the Hudson River area of New York state. Legend has it that this home suffered a mighty blow by a gallant wind storm, pushing it a few feet away from its foundation. The joints became weakened and needed bracing for support. Eventually, when electrical service was installed, the electrician had to tunnel his way through the maze of braces. A feature of this home is the driveway entry which allowed access to the basement rooms without having to disturb the main living area. This was used as a servant’s entrance, thus relating this home to fine homes like the White House in Washington, D.C. 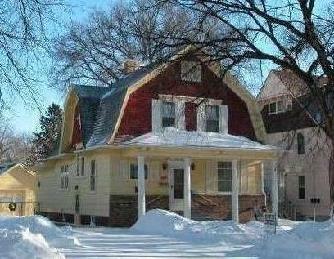 In the early 1900s this home had extra bedrooms, and used to accommodate railroad employees from Jamestown and Dickinson when their employment required an overnight stay in Mandan. There are numerous tales about the aging Herman Swanson, who became hard of hearing before he lost his driver’s license. He would rev up the engine on his car and when he felt the purr of the engine he would engage the clutch and aimlessly plow out of the driveway, leaving groove marks along the side of the house that apparently guided him out onto the street.